188 Marlborough is located on the south side of Marlborough, between Dartmouth and Exeter, with 186 Marlborough to the east and 190 Marlborough to the west. 188 Marlborough was designed by Sturgis and Brigham, architects, and built in 1884-1885 by Lyman Willcutt, mason, and B. D. Whitcomb, carpenter, as the home of Dr. James Jackson Minot, a physician specializing in diseases of the lungs, and his wife, Elizabeth (Whitney) Minot. They previously had lived at 77 Marlborough, following their marriage in October of 1884. The land for 188 Marlborough was purchased on September 22, 1884, by Elizabeth Whitney’s father, Henry Austin Whitney, from dry goods merchant Eben Jordan (founder of Jordan, Marsh & Co.). It was the western half of a lot Eben Jordan had purchased on September 13, 1884, from the Commonwealth of Massachusetts. Click here for an index to the deeds for 188 Marlborough. Henry Whitney died in February of 1889. In his will, he left his property to his five children, establishing trusts for his two daughters, Elizabeth (Whitney) Minot and Constance Whitney. On May 24, 1889, William Dexter, trustee for Elizabeth Minot, acquired her siblings’ interests in 188 Marlborough. In 1891, the Minots built a home at 616 Blue Hill Avenue in Milton, adjacent to Henry Whitney’s former home. The Minots spent the 1900-1901 winter season in Santa Barbara, California, and 188 Marlborough was the home of attorney James Lowell Putnam and his wife, Eleanor Jay (Robinson) Putnam. They had married in April of 1900 and had lived briefly at 488 Beacon, the home of his parents, George and Harriet (Lowell) Putnam, before moving to 188 Marlborough for the winter season. 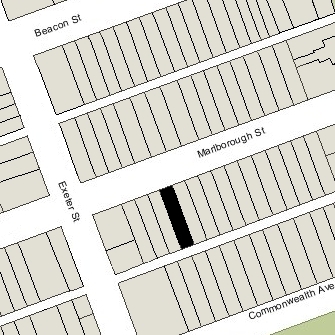 By the 1901-1902 season, they had moved to 32 Commonwealth and the Minots were living at 188 Marlborough once again. Elizabeth Minot died in February of 1903. James Jackson Minot continued to live at 188 Marlborough and in Milton. 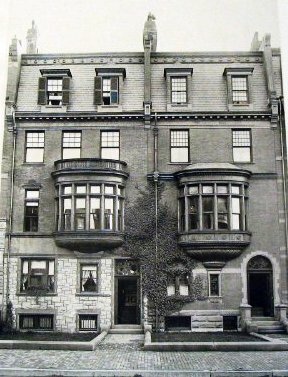 The Minots’ sons – George Richards Minot, James Jackson Minot, Jr., and Henry Whitney Minot – lived with their father at 188 Marlborough. George Richards Minot, a physician, married in June of 1915 to Marian Linzee Weld. After their marriage, they lived in an apartment at 224 Marlborough, at 247 Beacon by 1920, and at 30 Marlborough from 1923. He continued to maintain his medical office at 188 Marlborough with his father. 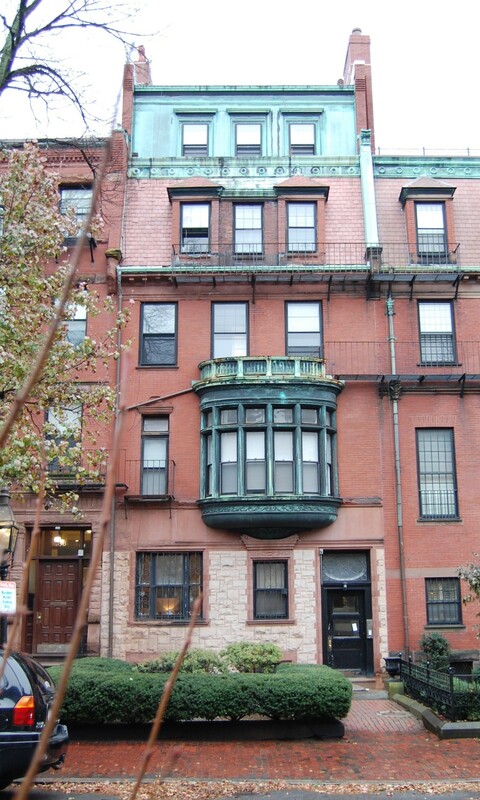 During the 1929-1930 winter season, George and Marian Minot lived at 188 Marlborough, moving soon thereafter to Brookline. George Richards Minot became a professor of medicine and director of Harvard’s Collis P. Huntington Memorial Hospital. He was a pioneer in research on blood diseases and in 1934 received a Nobel Prize for his work with William P. Murphy and George Hoyt Whipple on the treatment of pernicious anemia. James Jackson Minot, Jr., a banker and stockbroker, married in October of 1921 to Miriam Sears. After their marriage, they lived at 229 Marlborough. Henry Minot, a bond broker, married in October of 1924 to Ellen Sears Curtis. After their marriage, they lived at 9 Lime and then at 323 Beacon. Sometime between 1902 and 1908, James Jackson Minot remodeled the house, adding a fifth floor. It probably was at this time that a window was inserted between the dormers on the fourth floor. 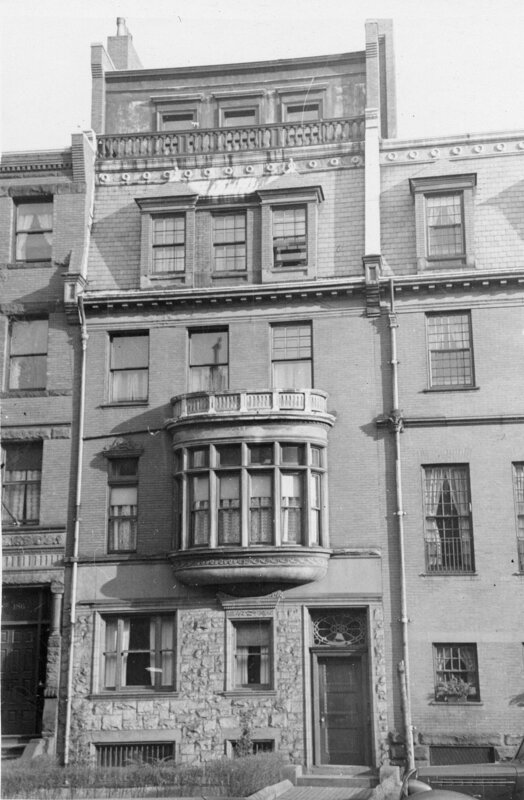 James Jackson Minot continued to live at 188 Marlborough until his death in April of 1938. On August 1, 1938, 188 Marlborough was purchased from the Minot family by John Sjodin, a printer, and his wife, Signe Petrovna (Pettersson) Sjodin. They had lived at 215 Commonwealth earlier in the year. In September of 1938, he filed for (and subsequently received) permission to convert 188 Marlborough from a single-family dwelling into a lodging house. At the same time, he also sought (and received) permission to change the occupancy of 190 Marlborough from a single-family dwelling into a lodging house, presumably acting for Harris Goller, who owned and lived at 190 Marlborough. In 1940, John Sjodin acted as agent for Constance Worcester to convert her family home at 186 Marlborough into a lodging house. John and Signe Sjodin continued to live and operate a lodging house at 188 Marlborough until about 1946. On February 27, 1946, 188 Marlborough was purchased from the Sjodins by Cecile Marie (Lagacé) Minihan, the wife of Daniel Richard Minihan, a carpenter. They operated 188 Marlborough as a lodging house. They previously had lived in Lowell. They continued to live at188 Marlborough until about 1960, when they moved to Framingham. On June 21, 1960, 188 Marlborough was purchased from Cecile Minihan by Elizabeth (Gunther) Ford Edson, the former wife of Edward Layton Ford and the widow of Robert Adams Edson, who continued to operate it as a lodging house. She lived at 114 Commonwealth, where she also operated a lodging house. On June 38. 1960, she transferred 188 Marlborough to Frances G. (Ford) Colby, the wife of Charles Robert Colby, Elizabeth Edson’s daughter with Edward Layton Ford. On April 4, 1966, 188 Marlborough was acquired from Frences Colby by Richard W. Huesman and Steven M. Levine. On August 20, 1968, Steven Levine transferred his interest in the property to Richard Huesman. On August 21, 1968, 188 Marlborough was purchased from Richard Huesman by David C. Keating. On October 7, 1968, he filed for (and subsequently received) permission to convert the property from a lodging house into twelve apartments. On September 11, 1974, Charles Colby foreclosed on David Keating’s mortgage and took possession of the property. On February 27, 1976, 188 Marlborough was acquired from Charles Colby by George E. Alepedis, owner of two Dunkin’ Donuts franchises in the Back Bay, and his wife, Anna Alepedis. On July 12, 1988, they transferred the property to their daughters, Betty Vasiliki Alepedis and Efharis Alepedis, both artists and jewelry designers. Betty Alepedis married in August of 1991 to Michael Stoukidis. On February 5, 2003, Betty Vasiliki Alepedis-Stoukides and Efharis Alepedis transferred 188 Marlborough to the 189 Marlborough Street LLC (Efharis Alepedis, manager of record). 188 Marlborough remained an apartment house in 2016.